Begonia care is easy when you take to time to select the best species for your comfort level and environment. With the right knowledge, many begonias are easy to grow and care for. You’ll be pleasantly surprised at how simple it is to ensure your begonia plants grow and prosper. The begonia family includes over 900 species (not including hybrids). The begonias grown as houseplants are warm-natured, and generally originate from tropical regions. All begonias have fleshy stems and uneven leaves – one half of the leaf is longer than the other. The shape of the leaves vary. Begonia leaves can be rounded with scalloped edges, elongated hearts, or ivy shaped forms. During the summer, moderated light is needed. An ideal location is near a window or under fluorescent lights. Blooming begonias need increased light in the winter. 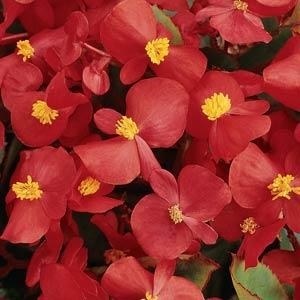 Protect begonia plants from cold temperatures. They will suffer damage by temperatures below 55° F / 13° C. Temperatures in the range of 65 - 75° F / 18 - 24° C are ideal for most species. Steady doses of liquid fertilizer diluted to ½ the strength will ensure begonias stay healthy. Feed plants every two weeks during active growth. Flowering plants benefit from a high-phosphorus fertilizer. Feed Rex begonias a balanced plant food. Begonias need moderate to dry humidity. You can place begonias on a tray of pebbles filled with water or place them near a humidifier. Avoid misting plants – this can lead to mildew problems. Consider growing begonias near houseplants with similar humidity requirements, such as bromeliads, ferns, and orchids. Begonias prefer a high-quality, well draining potting soil with perlite, or African violet soil. Avoid heavy, slow-drying soil mixtures. There are three types of begonias based on their roots: fibrous, tuberous, or a rhizome that spreads over the soil surface. They container size and shape you choose will depend on the type of root system. Begonias with fibrous roots, such as Angel-wing begonias, grow best when they become slightly root-bound in small pots. Rex Begonia varieties develop rhizomes that grow near the soil surface – broad, shallow containers are best for these begonias. Reiger begonias do not require repotting (unless you want to change containers). After repotting begonias, tap the sides of the pot to compress the soil into place – do not pack soil down using your fingers. Fancy – leafed types can be propagated from petiole leaf cuttings (like African violets). They will also develop plantlets when a leaf is pinned to the surface of dampened seed-starting mix – although this is a slower method of propagation.